When planning a trip to Italy, there are so many decisions one has to make. It can get pretty daunting– which tours? How much of the trip should be self-guided? In my experience, there are a few things you can do to alleviate the stress (and the lengthy museum lines): advanced booking and two passes– the Rolling Venice Pass and the Roma Pass. First up is the Rolling Venice pass. 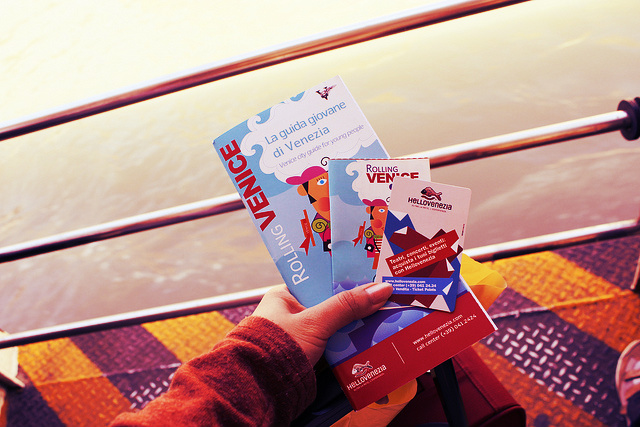 Sponsored by HelloVenezia, this pass is valuable for two reasons: discounts on local businesses, museums, and dining; and more importantly a massive discount on a 72-hour vaporetto pass. The latter alone, is worth the cost of this pass for the sheer freedom of unlimited and un-timed rides on Venice’s water bus system. It’s cost effective and allows you to hop on and off the boat at your heart’s content. While the informative booklet outlined several Venetian itineraries, I felt it best to go my own way. In fact, we didn’t even use the pass for any of its other discounts (which are valid for until Dec. 31st). All we knew was that paying a few extra euros for the transit pass discount was worth it considering a timed two-hour water bus ticket will run you about 7 euros each. Unfortunately, the Rolling Venice pass is only sold to travelers ages 14-29, so keep that in mind when considering this card. The Roma Pass has even more to offer. Three days worth of unlimited transit on all buses and light rail trains around Rome in addition to admission to two museums and/or archeological sites within their extensive list of participating locations. For only 30 euros, this is an incredibly good deal for those looking to get some local culture in and have the freedom to wander around using their fairly reasonable public transit. The option of purchasing additional (super discounted) concessionary tickets to sites is also a great deal and is quite a steal for you prolific marathon travelers who want to see it all in three days. We used our passes to get into the Galleria Borghese (you must call in advance for a reservation number then just bring you pass to the ticket counter when you arrive) and to the Coloseum/Palatine Hill/ Roman Forum which are all on a combined ticket. The major perk for using Roma pass to these places? NO LINES. For ANY of these places! Despite the long lines we saw approaching the Coloseum! The lines for non-Roma Pass visitors wrapped around the entire structure, but Roma Pass users needed only to walk through the designated turnstiles. Considering it was 90 degrees out that day, we were pretty happy about that. I hope this post has inspired you to make the most out of your visits to Venice and Rome. While exploring on your own can make for the trip of a lifetime, realistically, there are certain touristy sites we all want to see in our lifetime (ie: Colosseum), so these passes offer an economical way to get more out of those euros. Hello. Where can I buy a Rolling Venice Pass?